Chatham County has more to offer than many of us realize. 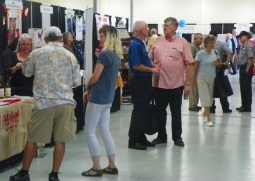 Whether you are curious about the businesses in our community or you are entertaining the idea of starting your own business, the business showcase is a great event that is open to the public to see what our community has to offer. Head over to Pittsboro Ford for this fun and informative event! “The Chatham Chamber of Commerce is a membership-driven organization focusing on the economic vitality of Chatham County and the increased visibility and advocacy of its members. The Chamber provides membership services to increase the visibility of its members among county residents, businesses, elected officials and awareness at a state, county and local level through business advocacy. The Chamber also serves as a great informational resource for residents, tourists and for individuals who are relocating to the Chatham County area. Brochures, school information, phone books and other helpful printed material are displayed in the Chamber office. This quote comes straight from the Chamber of Commerce website which is loaded with information. Want to learn about events, business directory, membership, more information on the chamber and more? Their website is the place to go.